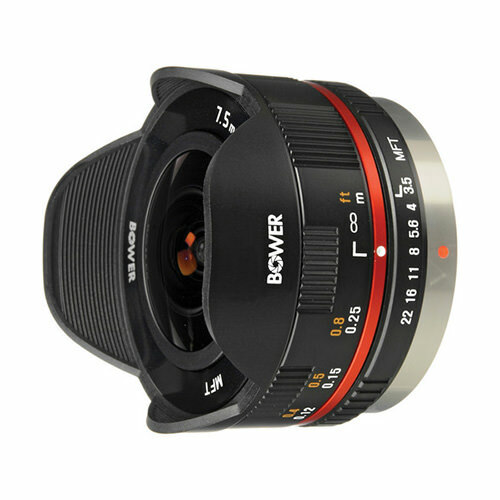 Lens Description: The 7.5mm f/3.5 Fisheye Lens for Micro 4/3 Cameras (Black) from Bower gives you a dramatic 180° view with an exaggerated perspective when used with a Micro 4/3 camera. Hybrid aspherical lenses and multi-coating help you to produce sharply defined images with a minimum of ghosting and flare. This compact and lightweight manual focus 7.5mm lens focuses as close as 4" (10cm) from the lens for totally awesome wide-angle distortion effects. 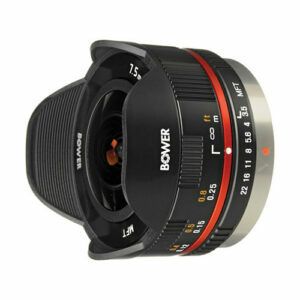 A built-in petal lens hood is included.